on a much more personal note for you, it's just been announced that the young student who killed all of those other students and professors in Virginia was a South Korean, and I wondered if you had a comment on that? Ban Ki-moon: On this very tragic [incident], I feel very much sorry and troubled, and any such rampant killing of innocent citizens and children is totally not acceptable and I condemn it in strongest terms possible. At noon, the spokesperson said that "the Secretary-General does not have any reaction on the specific nationality of the shooter. I think he condemns what happened regardless of the nationality of the person involved." Outside the Security Council, Japanese media repeatedly but politely asked Ban Ki-moon for a comment, no matter how short, on the shooting by yakuza gangs of disarmament icon Iccho Ito, Nagasaki's mayor. In the face of one request, it was clear to those present that Mr. Ban had not heard of the shooting, nor of Iccho Ito. (The murder made news worldwide, including in the U.S. on PBS' Newshour.) It was explained to Ban's close aide, who indicated something might happen by the afternoon. Nothing did, although one intrepid correspondent managed through persistence managed to get a quote from an official at UN Disarmament. Later, this aide more candidly expressed anguish about the Korean connection, as has the president in Seoul and the mission in New York. Then why play hide the ball? Spokesperson: What they said was they weren�t able to identify who exactly did it. Whether they were present or not, there would have been the same conclusion. Question: But did they speak with them? Did they interview them and say who fired the rubber bullets and did it? Spokesperson: I don�t really know the details of the investigation, but we can try to find out for you. Later a spokesperson said that an answer would have to await the completion of the investigation. But why then announce "interim" results? In Pristina, Special Prosecutor Robert Dean said if "you, after reviewing your reports, have questions for me, I am not going to be here tomorrow, but submit them and I will get to them." We'll see. Reporter: Moving ahead with a draft resolution perhaps, are things still on hold, waiting to see how this thing is going to play out or move ahead in the coming days? Ambassador Wolff: I refer that question to Washington, as you know Deputy Secretary Negroponte is in the region, he will be briefing the leadership when he gets back to Washington, and I think we will be making some decisions based on that. Inner City Press: Yesterday, the Sudanese Ambassador was telling reporters that the Darfur Peace Agreement precludes in their view, UN peacekeepers. 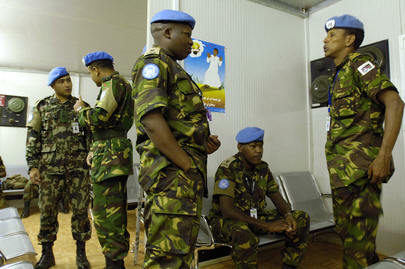 Logistics yes, peacekeepers no. Does this come up in the meetings? Does the U.S. have a different interpretation of the Darfur Peace Agreement? Ambassador Wolff: I don't think it is just the United States but others disagree with that interpretation, it does not preclude it. The Council met until 8:30 p.m., finalizing a presidential statement on Lebanon and Resolution 1701 which had been under negotiation for a week. UK Deputy Ambassador Karen Pierce read out the 20 paragraph PRST, and then Ambassadors trudged out, not a one stopping at the camera to comment. (French Amb. de la Sabliere considered it, then, no.) Inner City Press asked South African Ambassador Dumisani S. Kumalo if this was the longest presidential statement he'd even seen. Amb. Kumalo laughed and shook his head. "At this late hour," he said. Inner City Press: There's been a lot of controversy in the last few days about the first round of elections in Nigeria... that it was filled with fraud and should be redone. Is the United Nations in any way involved? Has Mr. Ban made any calls? Does the United Nations have any thoughts about this major election with, now, 50 deaths and a lot of irregularities, in Nigeria? Spokesperson: As you know, the United Nations is not, for the time being, involved in the electoral process. The process is being taken care of by the electoral council there. Inner City Press: Is there going to be... Is the United Nations observing it? Is it monitoring it? Spokesperson: No. The United Nations is not officially monitoring it. The distinction appears to be that large countries like Nigeria are much less likely to be commented on or observed than smaller nations. For example, the UN spoke out about the kidnapping of children in Haiti, but not of more frequent abuse of children in the conflicts in Brazil. Follow the power, and you'll see who's commented on. Actually, the UN or at least its secretive UN Development Program is involved in fraudulent Nigerian election. The Lagos-based publication This Day has quoted "the representative of UNDP in Nigeria, Hon. Jackie Weatherspoon" that "the report of a nation-wide study on causes of electoral violence points to ethnicity, endorsement of a particular candidate by leaders over other contestants and outright imposition of candidates as likely conflict factors." So why doesn't the UN and UNDP do something? Now seven opposition parties in Nigeria say they'll boycott the upcoming round. UNITED NATIONS, April 17 -- Global warming is "an act of aggression by the rich against the poor." This line was attributed on Tuesday to the president of Uganda, Yoweri Museveni, by the UK's foreign minister Margaret Beckett during a Security Council debate on the subject. It is not a statement that Uganda itself delivered on Tuesday. In fact, much of the day's debate was devoted to ambassadors from developing world denouncing the Security Council for holding the debate, for laying claim to issues of energy and climate change which, they said, more properly belong in the "more democratic" General Assembly, with its universal membership. This was the position of the Group of 77, chaired by Pakistan, and of the Non-Aligned Movement, chaired by Cuba. Cuban delegate Ileana Nunez Mordoche spoke of "balancing the organs" of the United Nations system. What was inescapable was that the countries speaking out against the Security Council having the debate of climate change produce far less carbon dioxide than the large countries supporting the debate. In India, for example, 1.2 metric tons of carbon dioxide were produced per capita in 2003. Indian Ambassador Nirupam Sen said Tuesday that the UN Security Council "may not have the mandate: to make an uncertain long term prospect a security threat amounts to an informal amendment of the Charter." Australia's Ambassador Robert Hill on Tuesday called the venue of the Council for the debate "warranted." Australia produced 18 metric tons of carbon dioxide were produced per capita in 2003 -- 15 times as much as India. Many of the island countries most immediately impacted by rising seas did not complain about the question of turf. Barbados Ambassador Christopher Hackett said he "believes that this debate in the Security Council should inspire the other principle organs of the United Nations to assume fully their Charter responsibilities in addressing the many dimensions of this problem." Tuvalu, which cannot so often be quoted at the UN, said through its Ambassador Afelee F. Pita that "slowly our coral reefs are dying through coral bleaching." Inner City Press asked Grenada's Ambassador Angus Friday if Grenada supported the debate in the Security Council. While understandably trying not to break from other developing countries, Amb. Friday said it "hinges on the definition of security," and then made it clear that global warming impacts Grenada's view of its security. Video here. Sudan's Ambassador Abdalmahmood Abdalhaleem called the Council's overreaching particularly "alarming as it is taking place at a time when the process of system-wide coherence is gaining momentum in the UN." 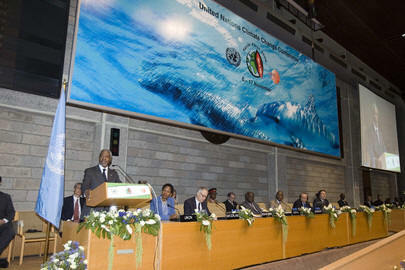 To many observers, there was something incoherent about developing countries denouncing a debate about climate change. It seems unlikely that a Security Council including gas-guzzlers the U.S. and China, and proud gas producer Russian would impose limits on greenhouse gas production using UN Charter's Chapter 7. For the G-77, it's the principle of the encroachment, harkening back to U.S. Ambassador John Bolton's insistence that UN procurement irregularities were a threat to international peace and security to be debated if not acted on by the Council. On the other hand, the Council was largely posturing or, as one wag put it, emanating hot air. There was no outcome from the debate. Even many of its proponents said that the only purpose was to get press coverage -- for the issue, they said, of course not for themselves and their nations. Whether hybrid cars in Hollywood and well-timed documentaries do a bit more in terms of public education is a question for more coherent minds to answer. UNITED NATIONS, April 16 -- Following an afternoon of meetings about Darfur, the head of UN Peacekeeping Jean-Marie Guehenno stood before the cameras with Sudan's Permanent Representative to the UN, Abdalmahmood Abdalhaleem. Mr. Guehenno made everything sound fine. The so-called "Heavy Support Package" had been agreed to, and he implied that Sudan will accept non-African peacekeeping troops if not enough Africans can be found. But minutes earlier, Abdalmahmood Abdalhaleem had told reporters that it is Sudan's position that the Darfur Peace Agreement that it has signed prohibits the introduction of non-African Union peacekeepers. Speaking exclusively to Inner City Press by the espresso bar of the UN's Vienna Cafe, Amb. Abdalhaleem complained that Sudan's experience with the UN has been "bureaucratic and unforthcoming." Asked if the purpose of his letter to Ban Ki-moon was only to trigger funding, Amb. Abdalhaleem said that the Security Council has to come forth with funding "or we will withdraw our offer." "This morning, I have received an official communication from the Sudanese Government through their Permanent Representative in New York, informing me that they agreed on the heavy support package in its entirety, including the helicopter component. This is a very positive sign, and I and the African Union intend to move quickly to prepare for the deployment of the heavy support package and the hybrid force." But Permanent Representative Abdalhaleem said again and again that given Sudan's position that the Darfur Peace Agreement prohibits UN peacekeepers, a force would be hybrid only in that the UN could provide a "backstop," and funding. UNITED NATIONS, April 12 -- "I have many years to go," Secretary General Ban Ki-moon told UN staff on Thursday, apologizing for bureaucratic delays in recruitment and promotion and what he is calling "mobility." He could have been directing this "give me time" plea more widely, as anonymous UN insiders quoted ad nauseam in this week's "Ban's First Hundred Days" stories have been saying. The critiques, which Mr. Ban has been closely reading, have focused on the ham-handed introduction of proposals to split the UN's Department of Peacekeeping Operations in two, and to alter the UN's Division of Disarmament Affairs. After acrimony, the proposals were modified, after Ban mollified UN power players (or steamrollers) whom many say Ban hadn't sufficiently considered, if only to work around, in the first place. Inner City Press: The urgent audit that you called for of UNDP in North Korea, that was supposed to be done in 90 days, we are almost at that time and they still haven't finished the terms of reference. So I am wondering is the time for the audit to be completed going to be extended, and also if the auditors are not allowed enter the DPRK, what will the UN system do in terms of concluding the audit? 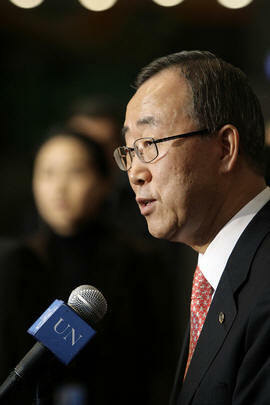 Ban Ki-moon: It is still under investigation. I do not have anything to tell you at this time. Whenever I have further information I will let you know. The background to this (non-) answer is not only that Mr. Ban was called Slippery Eel by the South Korean press, but also that Mr. Ban has previously been asked to let the UN Board of Auditors speak to the press about their work, which still hasn't happened. Likewise, Mr. Ban previously said he would instruct his heads of funds and programs like UNDP's Kemal Dervis to be available to the media. But Mr. Dervis has not held a single press conference since the Cash for Kim scandal broke. In fact, Mr. Ban's deputy secretary general, Asha Rose Migiro, has yet to hold a press conference, having so far publicly taken a total of four questions from the media, including one from Inner City Press about UNDP. Thursday a "senior UN official," who spoke only on that basis, said that Ms. Migiro will head up Ban's next structural hot potato, "System-Wide Coherence." Ms. Migiro will meet Friday on the topic with General Assembly president Sheikha Haya Rashed Al Khalifa. Good time to take questions? We'll see. This being a Hundred-Day, Sources-Say story, the focus is on management style and on telling details. Beyond the bungling announcement of the DPKO split, Assistant Secretary General for Peacekeeping Hedi Annabi only learned that he is being let go by watching on in-house TV the noon press briefing of February 9, at which chief of staff Vijay Nambiar read out a (hit) list. Inner City Press is informed -- not by Mr. Sach, who now only intermittently replies to emails -- that UN Controller Warren Sach has yet to know "will I stay or will I go," even as his contract expires this month. The LA Times' 100 Day story, sharper than most, described an incident most UN correspondents had heard, of Ban Ki-moon rebuking outgoing disarmament chief Nobuaki Tanaka in such a way that "talk that Ban would not brook dissent ricocheted all the way to U.N. outposts in Geneva and Vienna." How openly under Ban UN whistleblowers can be retaliated against is a question that still hasn't been answered. Recently a UNDP staffer, close to the Cash for Kim matter, was accused of leaking information and was told, "You're fired and by the way, you have to leave the country." UN staff who are not U.S. citizens can be silenced with the threat of loss of not only their UN jobs, but their ability to stay in the U.S.. This could be fixed, by Ban or the host country. But will it be fixed? UN staff have other questions, including whether the outsourcing of $9 billion from their Pension Fund, pushed forward by Kofi Annan's USG for Management Chris Burnham, will go forward. At Thursday's town hall meeting, Mr. Ban said he still hasn't decided. Last month, Mr. Ban passed the hat of being his Pension Fund representative from Warren Sach to USG for Management Alicia Barcena back to Mr. Sach. Ms. Barcena, among the most approachable of Team Ban, has told Inner City Press that the switch did not indicate any change in policy about privatization. But then why switch? In the town hall meeting, Ban emphasized the idea of job mobility within the UN system, saying that Ms. Barcena and ASG for Human Resources Jan Beagle would develop the idea. The Staff Union has called on Mr. Ban to remove Ms. Beagle from that position, something on which there's as yet no response.) Nor has there been any announcement of the winners of the dozen "mobility posts," including a speechwriter's gig, that he announced months ago. Some staff say those jobs were already handed out. How the winners are announced will be another test. Ban has reacted to other Hundred-Days stories by congratulating reporters, even those perceived as critical. There is at the UN something of a symbiosis: the beat reporters see their stars (and airtime or column inches) rise to the degree that the UN is important and its Secretary-General articulate and of interest. Recently, some question at Mr. Ban's press encounters are pre-screened, or at least pre-posed. Perhaps, one wag wondered, this is how it's done in South Korea. In fact, the back story to Mr. Ban's press availability on Thursday was his granting of face time to the South Korean media on Tuesday. When it was raised, a stakeout was arranged. It's been reported that during his recent trip through the Middle East, Mr. Ban dined each night with the South Korean ambassador to the country he was in. Some say that's fine, he knows these people. Others wonder at entanglements and influence. In the Cash for Kim audit, an irony's arisen. Some of the funding that is subject to the audit flowed from South to North Korea while Mr. Ban was Foreign Minister of South Korea. Inner City Press has asked the Office of the Spokesman for the Secretary General, how much? The spokesperson to whom such questions are assigned has referred Inner City Press first to the South Korean mission to the UN (which refused to answer or even respond), then to the South Korean Ministry of Foreign Affairs and Trade (where the spokesperson used to work, with Mr. Ban). "You can go beg the South Korean government," Inner City Press was told. Click here for that story. Well, no. The story will be told -- like Mr. Ban said, there are "many years to go." For now, we'll close with a seemingly apples-and-oranges comparison of the first 100 days, in the same state, of Ban Ki-moon and New York governor Eliot Spitzer, who has asked the press to call him a steamroller. 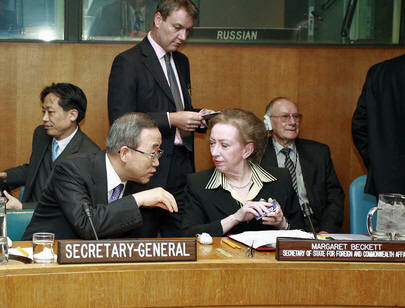 Ban Ki-moon took office promising to clean up the UN and its reputation, among other things. Eliot Spitzer said the same, and zeroed in on earmarks in the state budget, and lobbyist disclosure. While Ban Ki-moon made public his own financial disclosure form, none of the senior officials he has named has followed suit. Some argue that this must await action by the UN General Assembly. But Mr. Ban could have conditioned the granting of posts on the grantee making disclosure. One similarity is the need to back down. Spitzer had to back down on the budget, and was roughed up by the union of health care employees. Ban had to change, for example, his Disarmament program, had to go down himself -- not only sending chief of staff Vijay Nambiar -- to mollify the G77, as he will now have to do on System-Wide Coherence. Some say that the remaining ASG posts will be Ban's carrots to get needed support. Spitzer has quipped, "if we solved every problem in 100 days, there would be nothing left for us to do over the next three years and nine months." Mr. Ban might say the same -- perhaps he meant to -- except that it's FOUR year and nine months. Or maybe NINE years and nine months. Time alone will tell.